DMA:2010, the annual conference hosted by the Direct Marketing Association, was held this October at Moscone Center in San Francisco. The global event focuses on all marketing channels, from traditional to digital, and is an excellent resource for all marketing professionals. John Murray Productions partnered with Presentation Services on what proved to be one of our most challenging productions to date. 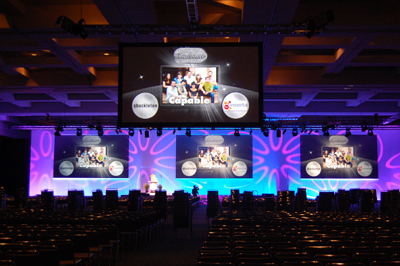 The set for the general session consisted of a custom made 126'x25' triple screen surround covered in seamless white muslin which doubled as a projection surface for lighting effects throughout the conference. The real challenge came in installing this behemoth stage set in the Moscone center which essentially consisted of a puzzle of 72 flatwalls in various sizes. The wall was installed in 2 segments, the first of which was flown on rigging points in the ceiling, and the second segment which was attached to the first once overhead. 130 linear feet of white muslin was stretched across the wall, and then cut creating windows for the screens. Three 15'x26' screens were then mounted within the seamless surround. 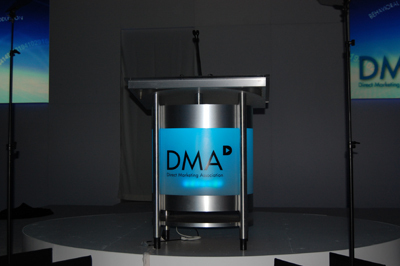 JMP also provided custom circular staging and stage decor including an internally lit, color changing lectern with DMA branding, stage furniture, and carpet. Thanks to a hard working and prepared crew, we had a very smooth install and the overall effect was striking and dynamic, providing an entertaining environment for one of the largest marketing conferences in the world.